We at Steed tailors know you all love those Classic Style Icons such as Steve McQueen, Cary Grant and Gianni Agnelli as much as we do. Therefore we’ve decided to start a new monthly article to be known as “Steed’s Style Icon of the Month”. We will decide which famous style icon is that month’s icon of the month by posting an image of the selected icon wearing a particular outfit. We will match the material and colour to the suit being worn. We offer this to our customers as some inspiration when deciding upon your next Steed commission. Each month a new iconic look will be posted. 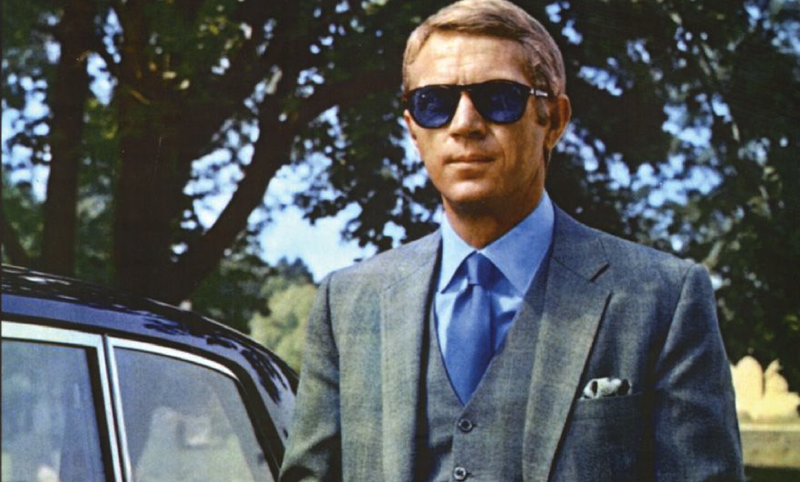 McQueen’s legendary suit from the 1968 film, The Thomas Crown Affair is a medium grey three-piece with a muted Glen Plaid. The grey suit has hints of blue, complemented by the blue lining, shirt, and tie. The jacket is single-breasted with notch lapels and a 2-button front. The jacket has long side vents and a one button cuff. The jacket also has straight flapped hip pockets and a dove grey silk handkerchief rakishly puffed in his out breast pocket. We have searched through plenty of images of the suit along with enjoying the film again for the first time in a long time and matched McQueens suit to a similar John G Hardy Cloth by Huddersfield Fine Worsterds.